This chemistry dictionary offers the chemistry definitions starting with the letter G. These glossary terms are commonly used in chemistry and chemical engineering. Click the letter below to find the terms and definitions beginning with that letter. gadolinium – Gadolinium is the name for the lanthanide element with atomic number 64 and is represented by the symbol Gd. gallium – Gallium is the name for the metal element with atomic number 31 and is represented by the symbol Ga. The Imperial or UK gallon is based on the size of 10 pounds of distilled water at 62 °F. The US gallon is based on the volume enclosed by 231 cubic inches. The US dry gallon is 268.8 cubic inches. galvanic cell – A galvanic cell is a cell where chemical reactions between dissimilar conductors connected through an electrolyte and a salt bridge produce electric energy. A galvanic cell can also be powered by spontaneous oxidation-reduction reactions. galvanization – Galvanization is a process that applies a coat of zinc to metal to prevent oxidation. galvanized steel – Galvanized steel is steel that has been covered with a layer of zinc metal. galvanometer – A galvanometer is a device for detecting and measuring small electric currents. Example: Many electric pH meters use a galvanometer to determine the pH of a solution. gamma radiation – Gamma radiation are photons with high energy emitted by radioactive nuclei. Gamma photons are often denoted by the Greek letter γ. Gamma rays originate in the nucleus, while X-rays originate in the electron cloud around the nucleus. gas – Gas is a state of matter consisting of particles that have neither a defined volume nor defined shape. Examples: Air, chlorine, and ozone are all gases at room temperature and pressure. where P is pressure, V is volume, n is the number of moles, and T is temperature. The value of the gas constant ‘R’ depends on the units used for pressure, volume and temperature. gasohol – Gasohol is a mixture of gasoline and ethanol. Gasohol is typically 90% gasoline and 10% ethanol. gauge pressure – Gauge pressure refers to the pressure of a system above atmospheric pressure. Gauge Pressure = Total Pressure – 1 atm. Gay-Lussac’s law – Gay-Lussac’s law is an ideal gas law where at constant volume, the pressure of an ideal gas is directly proportional to its absolute temperature. Geiger-Müller counter – A device used to measure the rate of radioactive decay. A type of radiation detector. gel – A gel is a sol in which the solid particles have meshed such that a rigid or semi-rigid mixture results. Example: Fruit jelly is an example of a gel. Cooked and cooled gelatin is another example of a gel. The protein molecules of gelatin crosslink to form a solid mesh which contains pockets of liquid. geochemistry – Geochemistry is the scientific study of the chemical composition of the Earth and other planets. It includes analysis of the chemical composition and reactions involving rocks, minerals and soils; the cycles of matter and energy in the earth, water, and air; and the ongoing processes that formed the Earth and change it. geology – Geology is the scientific study of the earth and the matter of which it is made. It includes the study of volcanoes, rocks, minerals, gemstones, earthquakes, fossil fuels, metals, and tectonics. Geologists seek to understand how the earth was formed, the processes that affect it, its properties, and its structure. geometric isomer – A geometric isomer is a chemical species with the same type and quantity of atoms as another species, yet having a different geometric structure. Example: Two geometric isomers exist for Pt(NH3)2Cl2, one in which the species are arranged around the Pt in the order Cl, Cl, NH3, NH3, and another in which the species are ordered NH3, Cl, NH3, Cl. germanium – Germanium is the name for the metalloid element with atomic number 32 and is represented by the symbol Ge. Gibbs free energy – Gibbs free energy is a thermodynamic property that was defined in 1876 by Josiah Willard Gibbs to predict whether a process will occur spontaneously at constant temperature and pressure. Gibbs free energy G is defined as G = H – TS where H, T, and S are the enthalpy, temperature, and entropy. Changes in the Gibbs free energy G correspond to changes in free energy for processes at constant temperature and pressure. The change in Gibbs free energy change is the maximum nonexpansion work obtainable under these conditions. ΔG is negative for spontaneous processes, positive for nonspontaneous processes and zero for processes at equilibrium. T is temperature, H is enthalpy, S is entropy, and G is free energy. giga – Giga is the prefix associated with x109 and is denoted by the symbol G.
Example: The distance from the Earth to the Sun is approximately 150,000,000,000 meters or 150 Gm. glass – A glass is an amorphous solid. The term is usually applied to inorganic solids and not to plastics or other organics. Glasses do not have crystalline internal structure. They usually are hard and brittle solids. glass transition – The glass transition is defined to be the reversible change in amorphous materials between a hard, brittle state into a rubbery molten state. Materials which are capable of undergoing a glass transition are termed glass. The glass transition is not considered to be a phase transition. When a viscous liquid is supercooled to the glass state, this is termed vitrification rather than glass transition. Otherwise, the glass transition from a liquid to glass may be caused by compression or cooling. glass transition temperature – Glass transition temperature is the temperature where a glass-liquid transition occurs. gln – Gln is an abbreviation for the amino acid glutamine. Glutamine is also abbreviated as Q.
glu – Glu is an abbreviation for the amino acid glutamic acid. Glutamic acid is also abbreviated as E.
gly – Gly is an abbreviation for the amino acid glycine. Glycine is also abbreviated as G.
glycerite – A glycerite is an extract prepared by soaking a sample in glycerin or a glycerin solution. Either vegetable-based or animal-based glycerin may be used, though it is customary to use plant-based glycerin to prepare herbal glycerites. Some chemical compounds are more soluble in glycerin than in water or alcohol, so they may be extracted more fully in a glycerite. Glycerin is non-toxic and glycerites containing 70% glycerin or a higher concentration suppress microbial growth (glycerin acts as a natural preservative). glycol – A glycol is a molecule that contains two hydroxyl groups. glycosidic bond – A glycosidic bond is a covalent bond that joins a carbohydrate to another functional group or molecule. G-protein coupled receptor – A G-protein coupled receptor is a type of cell surface protein that is coupled to G-proteins (guanosine triphosphate or GTP-binding protein). G proteins are a family of similar proteins located in the cell’s plasma membrane that binds to activated complexes and undergoes conformational changes by binding or hydrolyzing GTP to modify channel gates in the cellular membrane. In this way, the cell surface receptors are said to be coupled to intracellular responses. gold – Gold is the name of the transition metal element with atomic number 79 and is represented by the symbol Au. Graham’s Law – Graham’s Law is a relation which states that the rate of the effusion of a gas is inversely proportional to the square root of its density or molecular mass. Rate1 is the rate of effusion of one gas, expressed as volume or as moles per unit time. Rate2 is the rate of effusion of the second gas. M1 is the molar mass of gas 1. M2 is the molar mass of gas 2.
grain alcohol – Grain alcohol is a common name for the chemical compound ethanol. Ethanol is a colorless liquid with molecular formula C2H2OH. It is the alcohol found in alcoholic beverages. gram – A gram is a unit of mass in the metric system equal to the mass of one cubic centimeter of water at 4°C. The gram is the basic unit of mass in the CGS measurement system. gram molecular mass – Gram molecular mass is the mass in grams of one mole of a molecular substance. 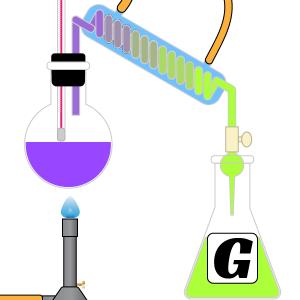 Examples: The molecular mass of N2 is 28, so the gram molecular mass of N2 is 28 g.
gravimetric analysis – Gravimetric analysis is a collection of quantitative analysis laboratory techniques based on the measurement of an analyte’s mass. One example of a gravimetric analysis technique can be used to determine the amount of an ion in a solution by dissolving a known amount of a compound containing the ion in a solvent to separate the ion from its compound. The ion is then precipitated or evaporated out of solution and weighed. gray A unit of the absorbed dose of radiation. One gray is one joule of energy absorbed per kilogram of tissue. green chemistry – Green chemistry is the branch of chemistry concerned with developing processes and products to reduce or eliminate hazardous substances. One of the goals of green chemistry is to prevent pollution at its source, as opposed to dealing with pollution after it has occurred. greenhouse effect – The greenhouse effect refers to the effect of water and carbon dioxide absorbing outgoing infrared radiation, raising a system’s temperature. The term is generally used with reference to the Earth’s temperature, although it can also be applied to other systems, such as greenhouses and automobiles. greenhouse gas – A greenhouse gas is a gas present in the atmosphere that absorbs and emits infrared radiation. Examples: Water vapor, carbon dioxide, nitrous oxide, and ozone are greenhouse gases. green vitriol – Green vitriol is a deprecated chemical term for the compound iron(II) sulfate, FeSO4. ground state – Ground state is the lowest allowed energy state of an atom, molecule, or ion. group – A group in chemistry is a vertical column of the periodic table. An alternate definition is any collection of elements with common chemical or physical properties. Groups I, II, III, IV – Groups I, II, III, and IV refer to cation groups in Qualitative analysis studies. The different groups are separated by the reagents used to precipitate out the cations. Precipitated in 1 M HCl. Precipitated in 0.1 M H2S solution at pH 9. Ba2+, Ca2+, and Mg2+ are precipitated in 0.2 M (NH4)2CO3 solution at pH 10; the other ions are soluble.